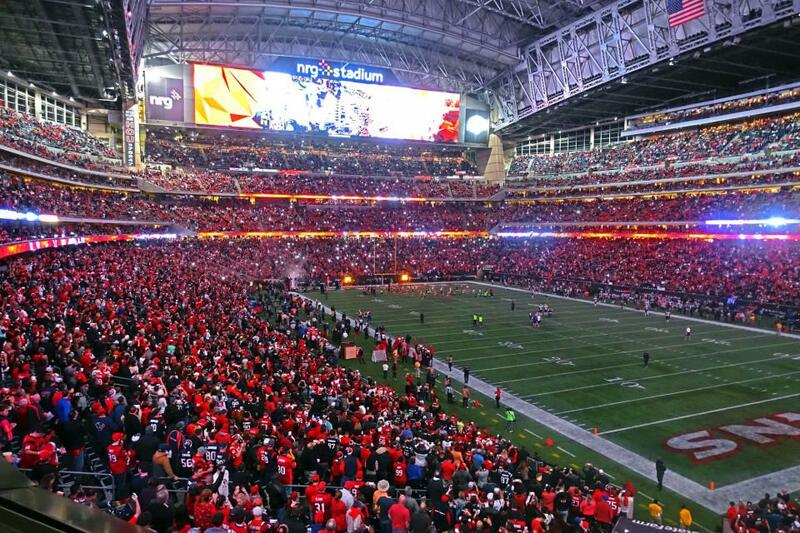 How much do Texans suites cost? 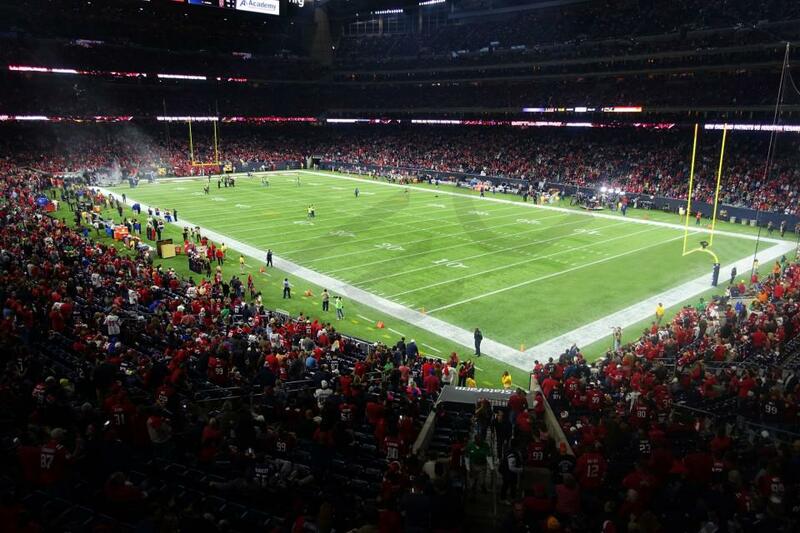 Houston Texans suite prices typically range from $22,000-$35,000 for Texans games. Lower Level suites on the 200 level will be the most expensive option on average. 400 Level suites are considered the middle level with 800 level suites being the third suite level at NRG Stadium. Prices for any suite level in Houston will vary based on day of game, opponent, and the location of the suite in NRG Stadium. Luxury suite prices for concerts, the Houston Livestock Show & Rodeo and other events at NRG Stadium can vary widely based on the type of event. 100 Level Texans suites are only available for football games. These suites are taken down for all secondary events. These are located right above the 100 level seating section near midfield. 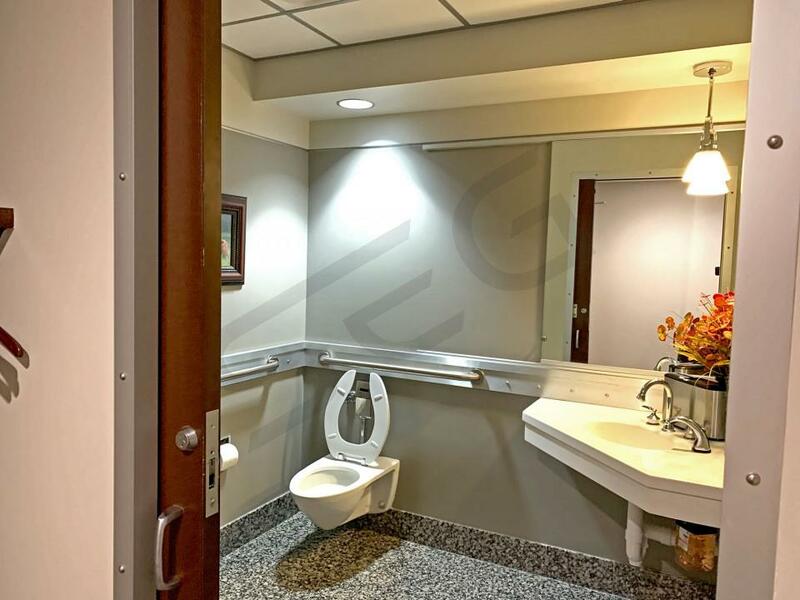 Premium in-suite catering options are available. Restrooms are located on the main concourse. 200 Level luxury suites will be the closest suite level to the playing field. Texans suites will include VIP parking passes and private entrance entry into NRG Stadium. Lower Level Texans suite amenities feature a dedicated suite attendant, in-suite catering options, private restrooms, fixed suite balcony seating and interior lounge seating. 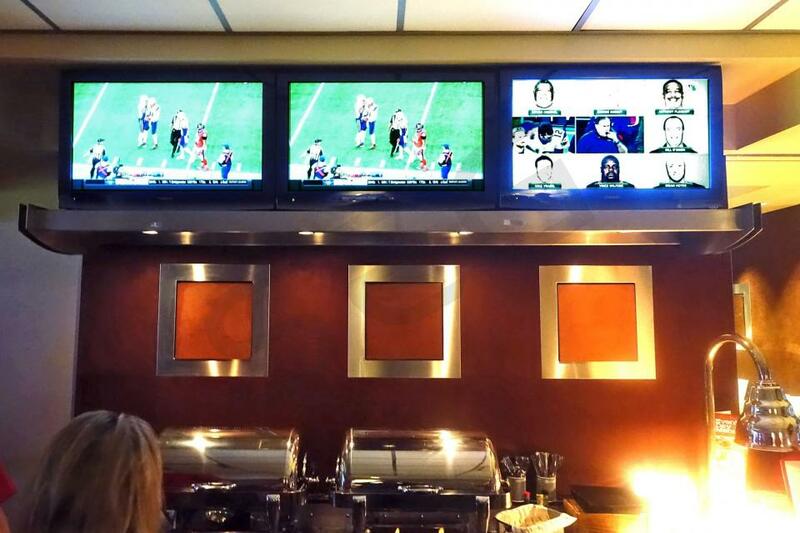 200 Level suites are equipped with multiple HDTVs and wifi. The 400 Suite Level at NRG Stadium will feature suites that are a little larger than those on the 200 Level. 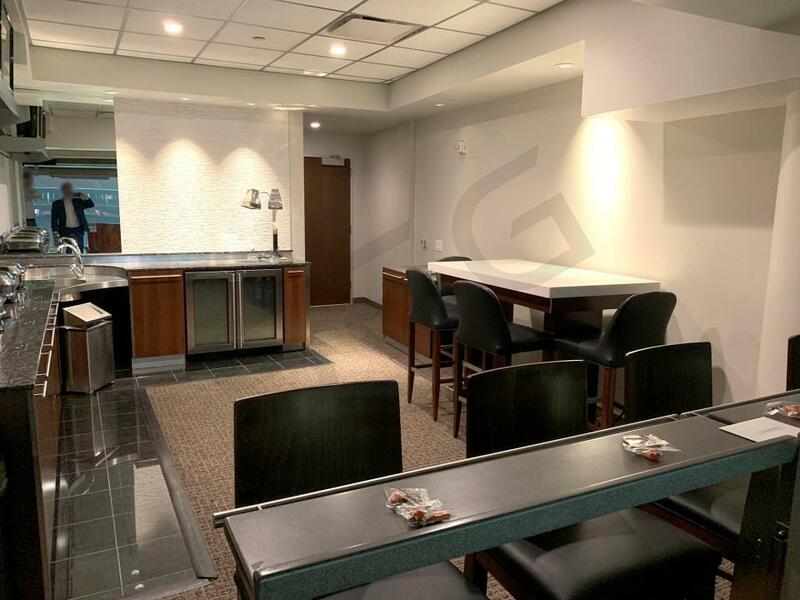 400 Level suite amenities include HDTVs, premium in-suite catering options, interior lounge seating, exterior premium seating, private restrooms, wifi and a dedicated suite attendant. The 400 Level is considered the middle suite level at NRG Stadium. 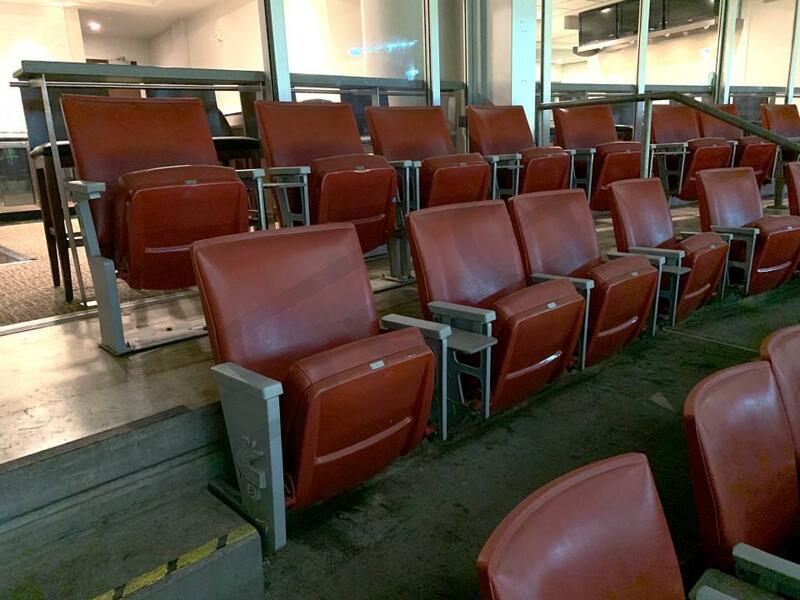 The 800 Suite Level at NRG Stadium is considered the 3rd suite level. 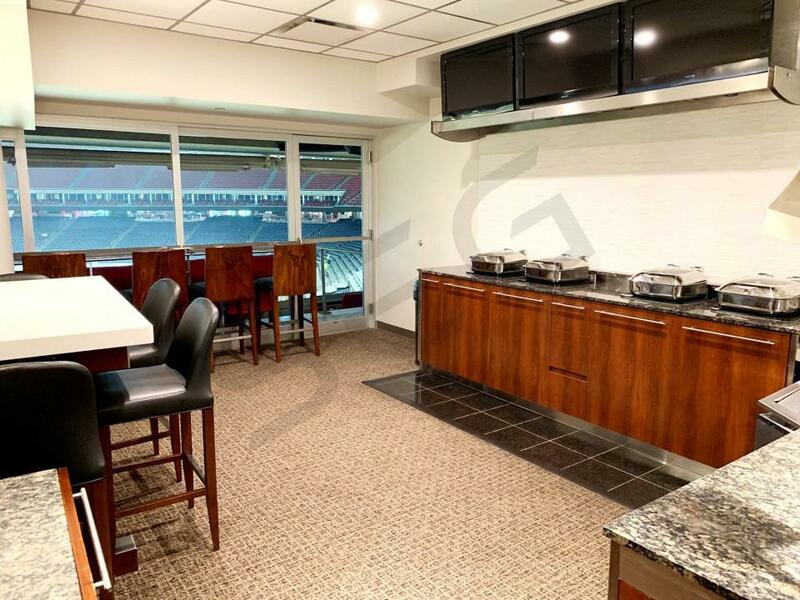 Texans suites on the 800 level are sideline suites only and they can accommodate larger groups. 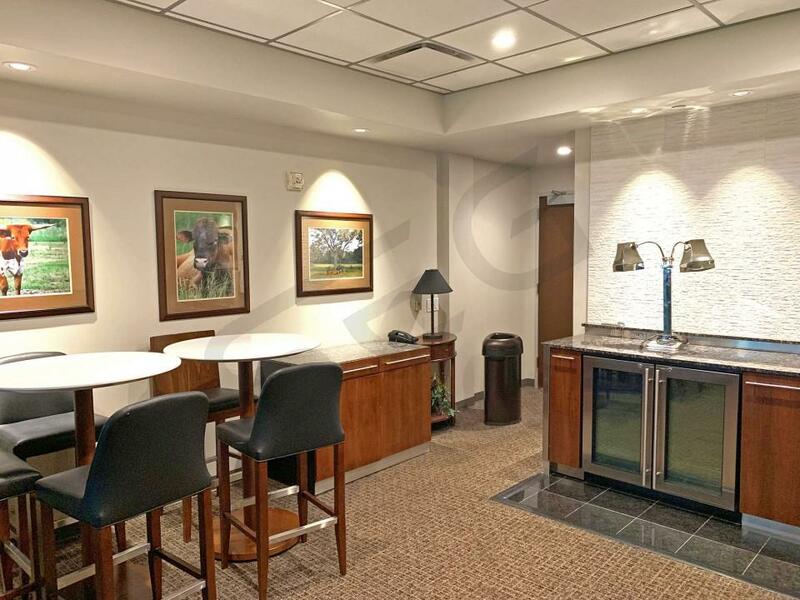 800 Level suites feature similar suite amenities as the 200 and 400 level have like HDTVs, wifi, premium in-suite catering options, closest space, a kitchenette and a dedicated suite attendant. Suite Experience Group helps customers worldwide plan corporate and personal events in private luxury suites at NRG Stadium. In this section we have highlighted the key elements to consider when planning an event in a suite at NRG Stadium. 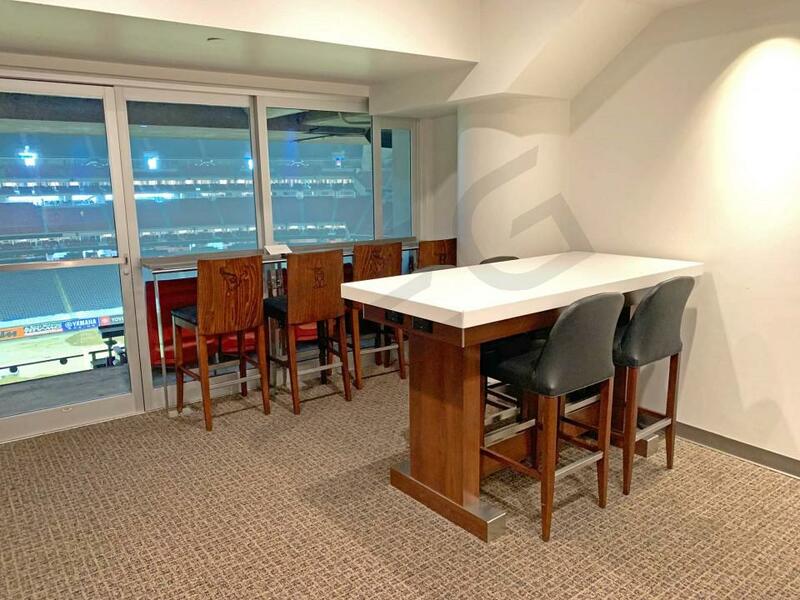 With multiple suite levels, NRG Stadium suites can accommodate up to 26 guests. NRG Stadium has four different suite levels: 100 level, 200 level, 400 level and 800 level. 100 Level Suites will come with 14 seats and we can help you secure additional “standing room” tickets at an added cost. Most 200 level suites come with 16 tickets, while 400 level suites include 22 tickets and 800 level suites top-out at 26 tickets in the suite. Prices for luxury suites at NRG Stadium generally range from $20,000 to $35,000 and vary widely based on the event and suite location. The Houston Texans, who have built a strong team and often sell out home games. NRG Stadium has also played host to the final four and other great sporting events. 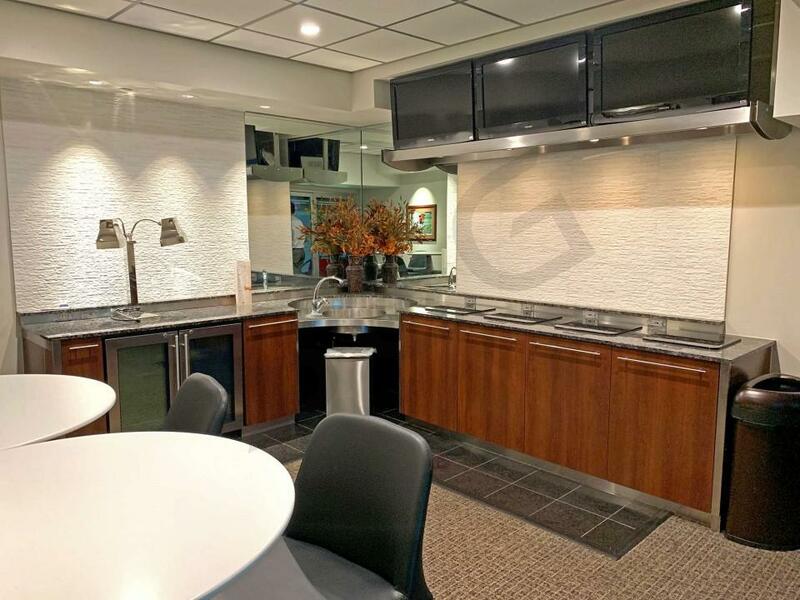 All luxury suites at NRG Stadium offer professional suite catering by Connoisseur from Aramark. Connoisseur's luxury suite catering menu features a local themed menu with international options. Depending on the size of your party, there will be predetermined packages and suggestions. Orders should be placed online and will be prepaid. The menu offers many options including stadium themed snacks, southern dishes, and a full beverage menu. All Suite tickets at NRG stadium will give you access to the Verizon Wireless East and West Club. These 23,000 square feet clubs offer a climate controlled lounge, many flat screen TV’s and premium food and beverage options. They are located on both sides of the stadium with easy access from the suites. Many Texans fans will be wearing their favorite player’s jersey, however other guests in the private suite will be dressed in business casual attire. When in doubt, ask the host of your suite for recommended attire. NRG Stadium is located at One NRG Park in Houston. The Houston Metro and METRORail has many routes close to the stadium and the complex. NRG Stadium will use Gate 9 which is on the corner of Westridge and Kirby. For an exact destination we recommend using the address 8825 Kirby Drive, Houston, TX 77054. If you plan to use a ride sharing service, we recommend Uber as they have teamed up with the Texans. The designated pick up spot will be outside of NRG Center. Driving is also a practical option assuming you have a VIP parking pass. Private boxes at NRG Stadium will come with between 4-8 parking passes. If you do not have a parking pass there are over 26,000 parking spots at the NRG complex. Rates will vary but are generally around $40. Additionally, all of the suite levels may be accessed by using the VIP entrances on the east and west sides of the building. All Suite Tickets will include entrance to the private suite area for at least one hour before the game. There are private VIP entrances located on the east and west side of the stadium. 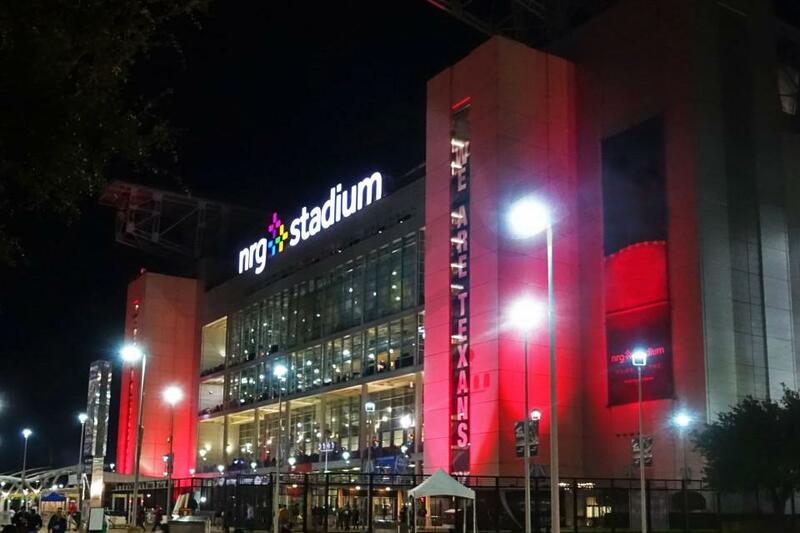 All fans entering NRG Stadium will go through a metal detector screening. The NFL has implemented a policy that patrons must bring all their items in bags that are clear plastic, vinyl or PVC that does not exceed 12" x 6" x 12." While last season wasn’t the type of year the Houston Texans had in mind, there’s plenty of excitement surrounding the 2018 Texans team. Quarterback Deshaun Watson while healthy, turned this Texans offense into one of the most dynamic units in the NFL. Recovering from an ACL injury, Watson and the Texans hope to continue what they started this season. J.J. Watt also is hoping for an injury free season in 2018. Watt is arguably the best at his position when healthy. The Texans have all the pieces in place to make a run for the playoffs this year. Lamar Miller and DeAndre Hopkins could be in for the best seasons yet with a full year of Watson under center. Watt, Jadeveon Clowney and Whitney Mercilus could help form the best defensive pass rush in the NFL. To help the secondary, the Texans made a big signing in free agency by signing Tyrann Mathieu. 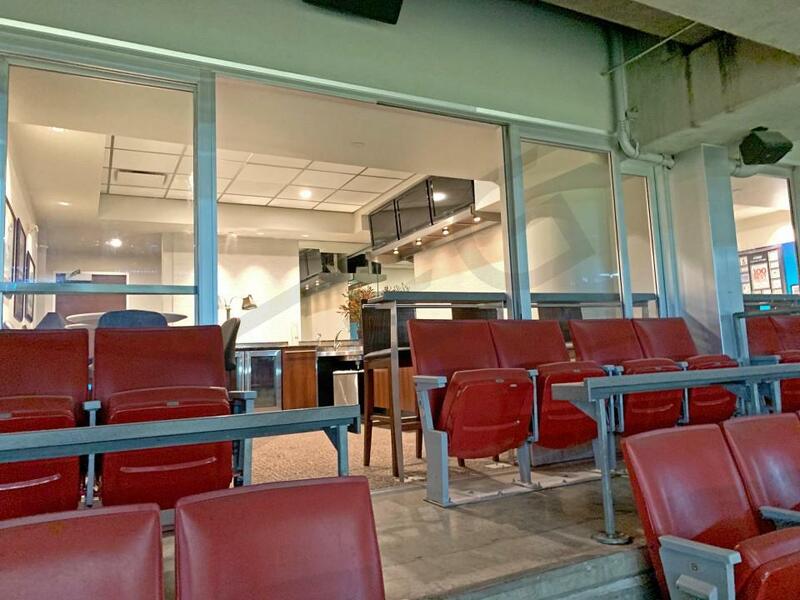 Experience Texans football from an NRG Stadium luxury suite. 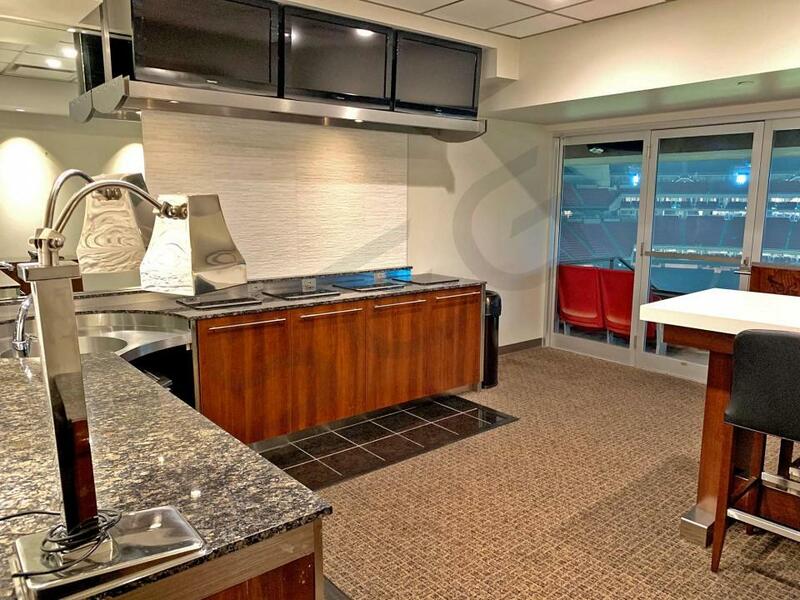 Suites for Texans games will vary in price, but all will offer you an incredible VIP experience. 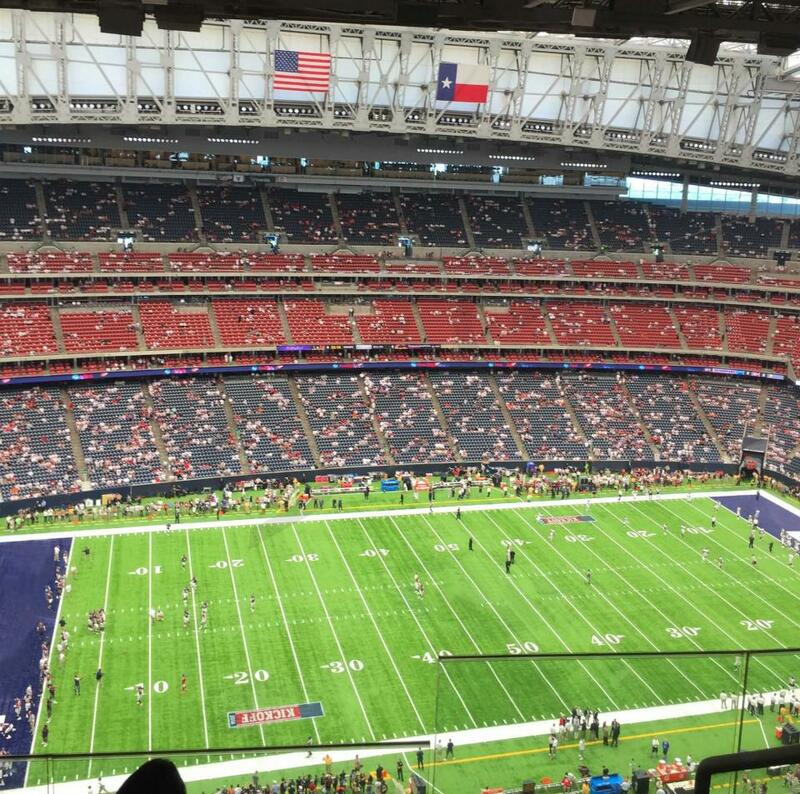 For Texans games, suites will be located on the 100, 200, 400 and 800 levels. The 100-suite level will feature only a handful suites located near midfield. 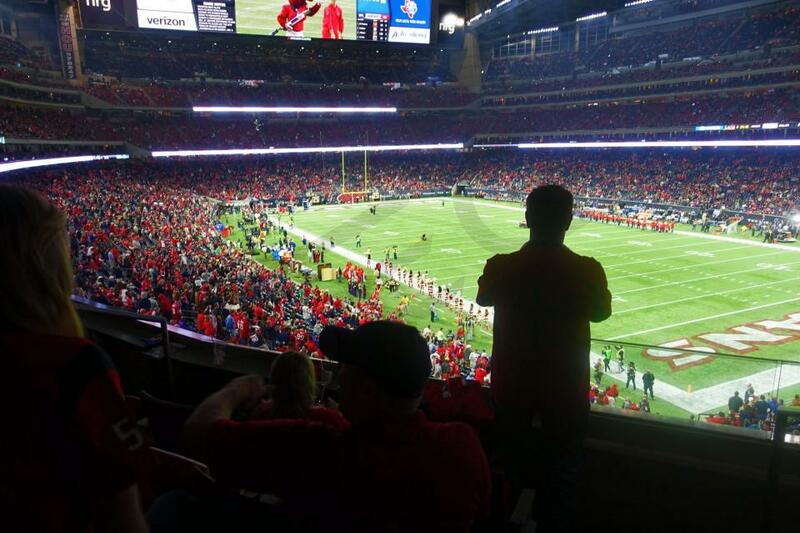 The 200 level is the most preferred suite level at NRG Stadium. 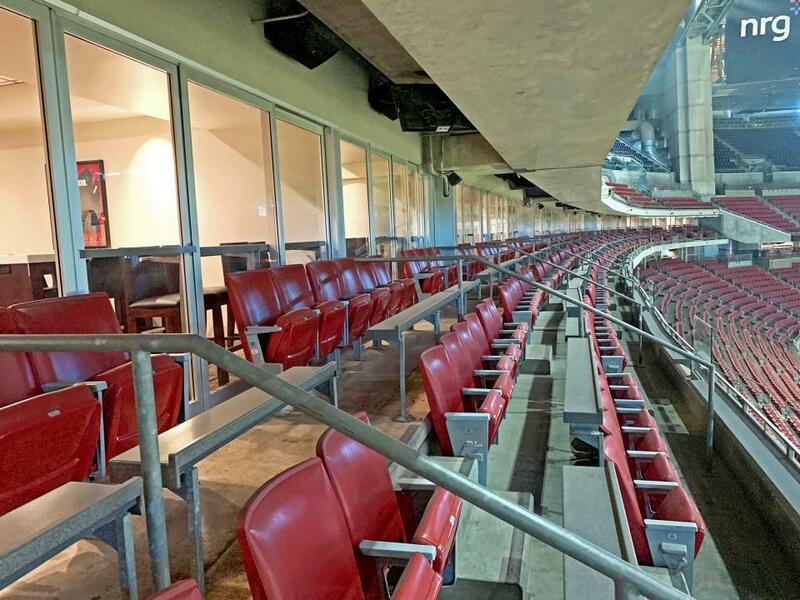 The 800 level suites are built for larger groups, these suites are also enclosed with a glass window in front of your seating. All Texans suites will include HDTVs, access to private restrooms on the suite levels, balcony seating and a dedicated Texans suite attendant. 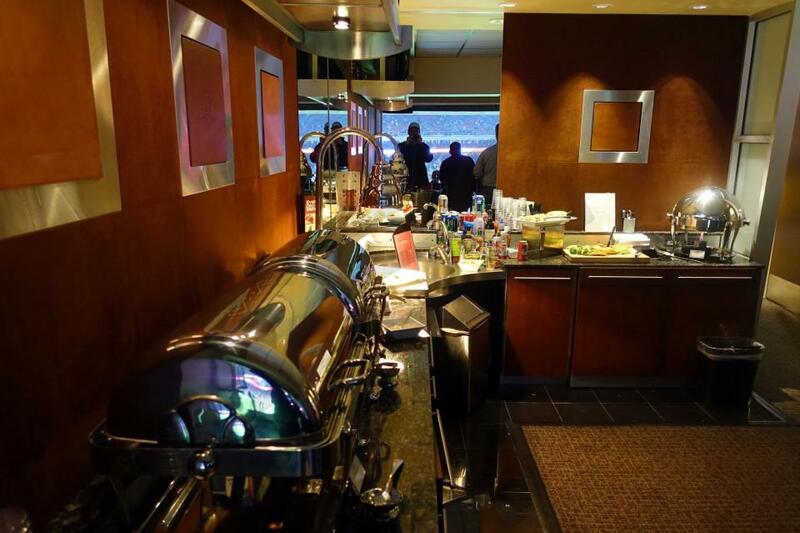 Suites will not include food or beverage, but you can purchase catering in advance to your event. While the Texans are the main attraction at NRG Stadium, the venue also hosts the AdvoCare Texas Kickoff every year. In 2018, the AdvoCare Texas Kickoff features LSU vs. BYU. In December, the Texas Bowl will be played in NRG Stadium. Big name performers like Taylor Swift and Beyoncé & Jay-Z will also take the stage in Houston. The 2017 Houston Texans are fresh off another postseason run and will look to get further into the playoffs this season with a new quarterback at the helm. The Texans selected Deshaun Watson in the first-round of the NFL Draft. Brock Osweiler is no longer with the team leaving QB duties to Watson, Tom Savage and Brandon Weeden. It’s hard to imagine head coach, Bill O’Brien, not giving Watson a shot at some point this season. In hope to lighten the load of running back, Lamar Miller, the Texans also drafted D’Onta Foreman in the third-round. The wide receivers feature one of the best receivers in the NFL in DeAndre Hopkins. Following Hopkins, they have Will Fuller and Jaelen Strong. The Texans also use both tight ends, CJ Fiedorowicz and Ryan Griffin heavily in their offense. Texans fans know that their team is led by their defense. Who better to lead a defense than former Defensive Player of the Year, JJ Watt. Watt is back healthy after suffering an injury that cost Watt most of the 2016 season. Jadeveon Clowney, Whitney Mercilus and Brian Cushing give Watt an amazing supporting cast inside. If that’s not enough, with their second-round draft selection, the Texans picked LB Zach Cunningham. Texans fans will get a chance to see of the best NFL teams visit NRG Stadium in 2017. At home, the Texans will be taking on the Pittsburgh Steelers on Christmas Day, the San Francisco 49ers, Arizona Cardinals, Indianapolis Colts, Cleveland Browns, Kansas City Chiefs, Tennessee Titans and the Jacksonville Jaguars. The Dallas Cowboys will also be coming to NRG Stadium in a pre-season game this year. 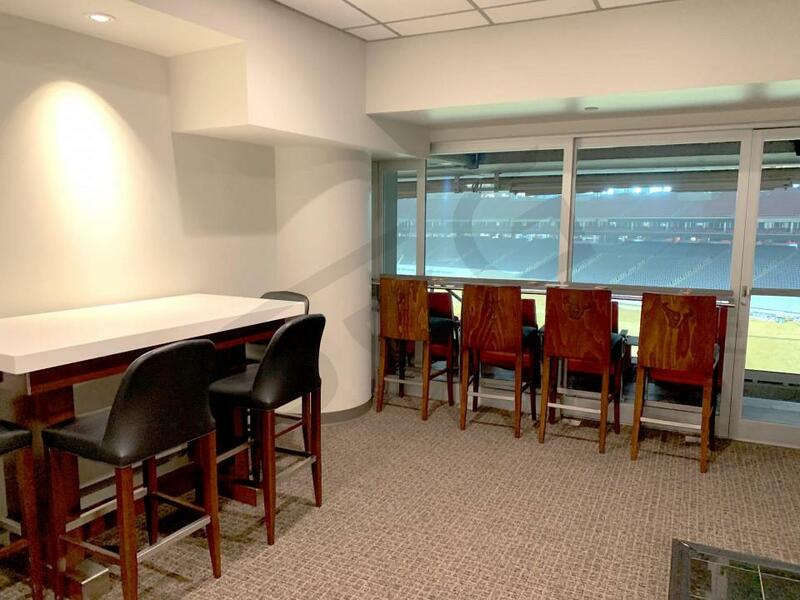 Suites and Special Events: A Houston Texans suite can accommodate a small or large group. 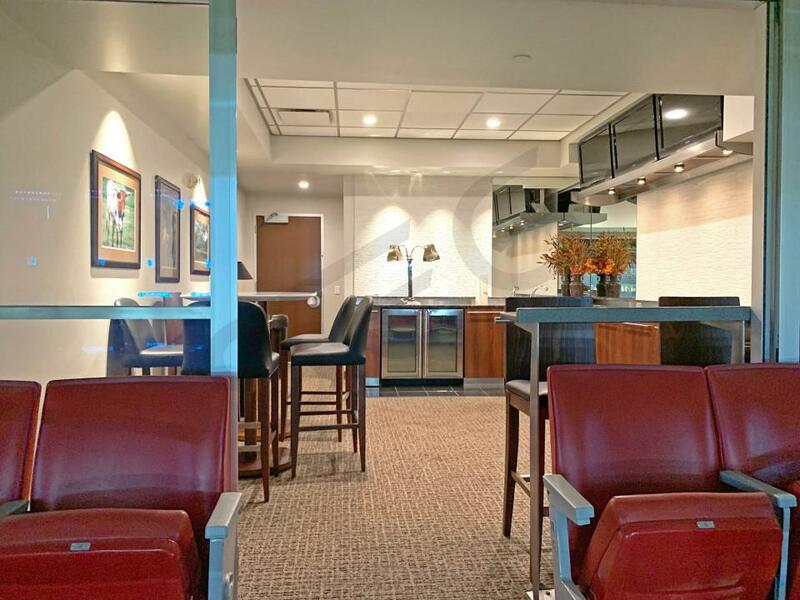 Suites for the Texans at NRG Stadium feature HDTVs, Wi-Fi, upscale furnishing, premium in-suite catering options, a dedicated suite attendant and interior/exterior seating. Your VIP experience at a Texans game will include private entry into NRG Stadium and exclusive access to the VIP clubs inside. 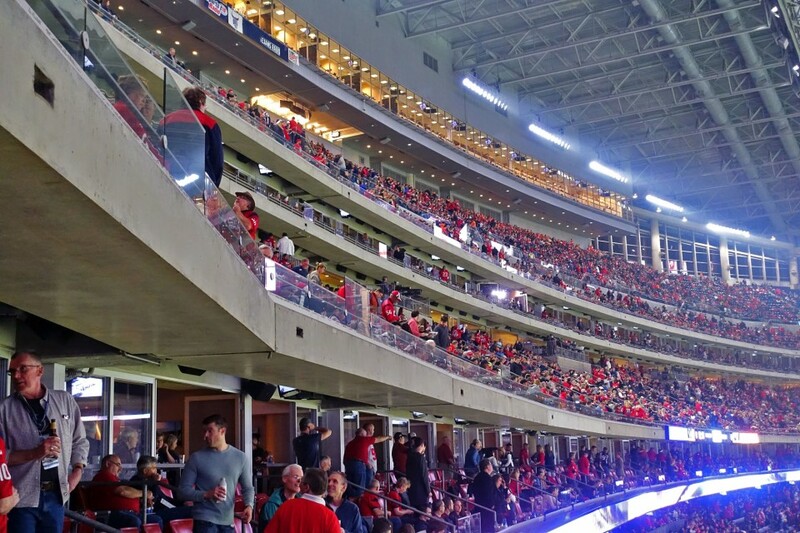 At NRG Stadium, there are multiple suite levels including the 100 Level, 200 Level, 400 Level & 800 Level. NRG Stadium is hosting several non-NFL events in 2017 including Metallica, U2, Coldplay, the 2017 AdvoCare Texas Kickoff (LSU vs. BYU) and the AdvoCare Texas Bowl. Offense: The Houston Texans lost 30-0 in the wildcard round of the 2015 playoffs to the Kansas City Chiefs. The loss left a bitter taste in the mouth of the Texans who expected to do some damage in the playoffs after winning the NFC South. In 2016 Bill O'Brien, a renowned offensive mind, finally has some offensive weapons and a quarterback to get the ball to them. In the offseason the Texans signed quarterback Brock Osweiler away from the Denver Broncos and are hoping that his time under Peyton Manning's tutelage translates to big time on-field production. The Texans also signed tailback Lamar Miller, a guy who they expect will take their #1 running back spot and run away with it. In the passing game the Texans most dangerous weapon is All-Pro wideout Deandre Hopkins. The Texans hope that Hopkins plus rookie speedsters Will Fuller and Braxton Miller will force defenses to respect their rebooted passing game. Defense: Any team that has JJ Watt is going to have a top-rated defense. Watt is the unquestioned top defender in the NFL and when you think about his game the phrase "destroyer of quarterbacks" comes to mind. The Wisconsin product is the most versatile and productive defensive lineman in the NFL and has had a historic beginning to his career. Last year he produced 17.5 sacks and led the NFL with 29 tackles for loss. This defense is built around Watt and stalwart defensive tackle Vince Wilfork. 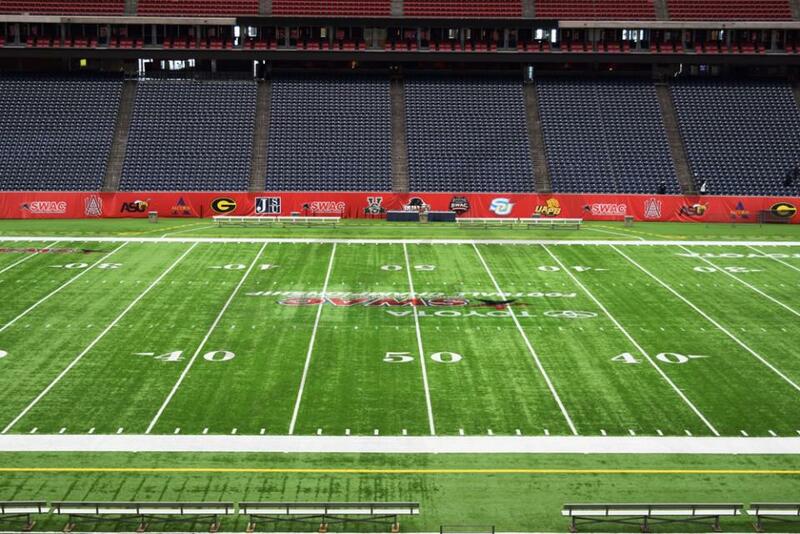 Any team coming into NRG stadium can expect to have a hard time doing anything up the middle versus the Texans. Schedule: NRG Stadium provides fans with the ultimate game day experience. This season, the Texans will be hosting a number of great teams at NRG Stadium. Those teams include the Indianapolis Colts, Chicago Bears, Jacksonville Jaguars, Tennessee Titans, Kansas City Chiefs, Detroit Lions, San Diego Chargers, and Cincinatti Bengals. 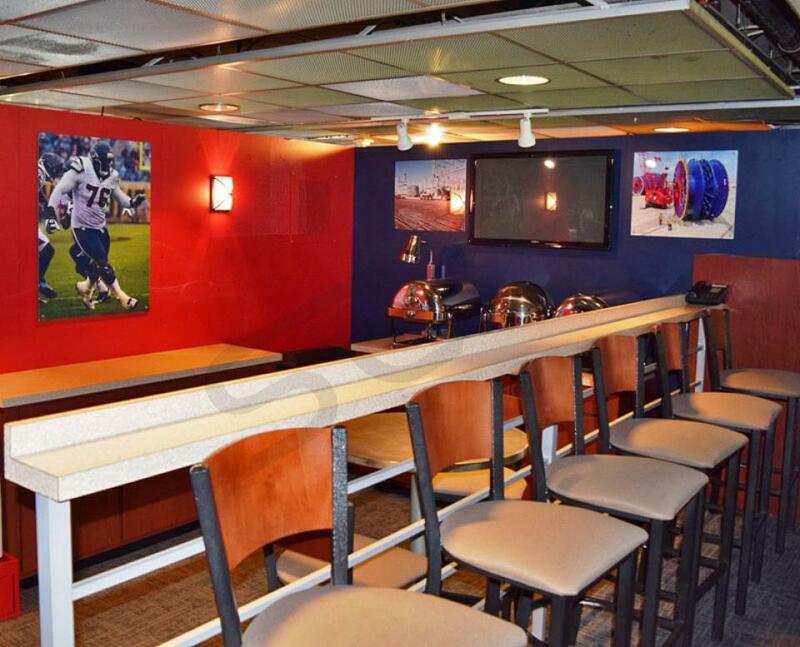 Suites and Special Events: A Texans suite can accommodate a small or large group. 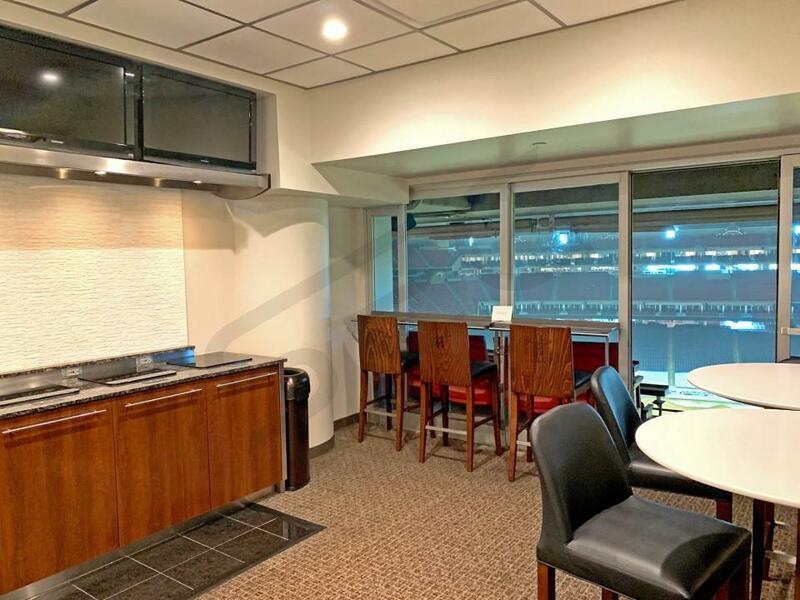 Suites for the Texans at NRG Stadium feature HDTVs, Wi-Fi, upscale furnishing, premium in-suite catering options, a dedicated suite attendant and interior/exterior seating. Your VIP experience at a Texans game will include private entry into NRG Stadium and exclusive access to the VIP clubs inside. NRG Stadium is hosting a number of non-NFL events in 2016 including the Ringling Brothers Barnum and Bailey Circus, the Beyonce Formation Tour, Guns N Roses, the Advocare Texas Kickoff College Football Game: Houston Cougars vs. Oklahoma Sooners, the Texas Bowl and Super Bowl LI. 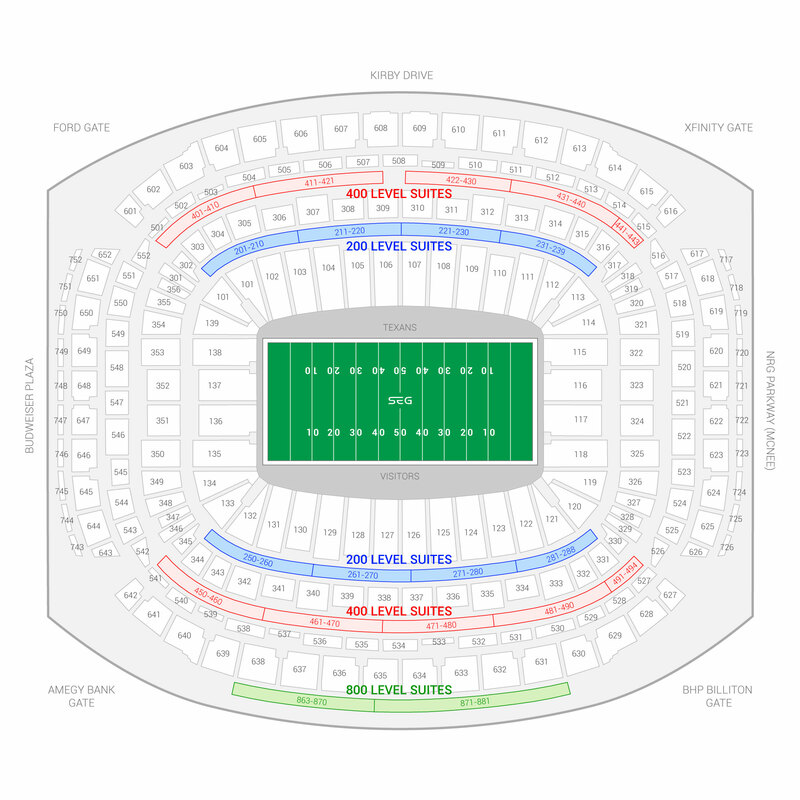 The seating chart below shows where the Houston Texans suites at NRG Stadium are located.